The intervention of the angels might prove enough to whack Asmodeus out of dominance... or it might not. 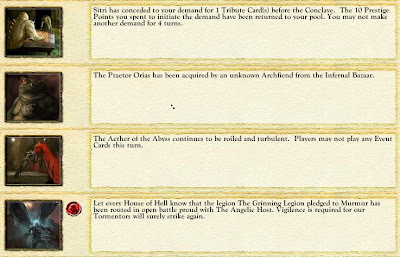 Apparently, the archfiend's legions are very resilient and were able to survive a first confrontation. 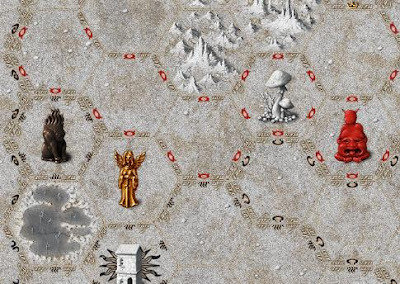 The Hammers of Hell have been decimated, however, and would not survive a second assault. Gilles decides to observe the situation while amassing armies. He bids on the Sisters of Sorrow and the Throne of Skulls. The slaves of God are on a rampage. The dreadful Legion of the Maw has been destroyed in its entirety. Gilles begins to wonder if he could pull out a military victory. If Asmodeus and Paimon are subdued by the Tyrant of Heaven, he could potentially attack Pandemonium and hold it long enough. In the meantime, Gilles orders the Sisters of Sorrow to a defensive position southeast of his palace. 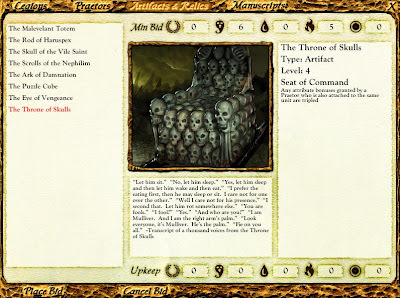 Gilles would like to give the Throne of Skulls to his own Slaves, so that Eligos could use its power, but Gilles's demons are not powerful enough to handle such an artifact. He stores it in his secret vault, waiting for the proper time to use it. Then he notices that the praetor Valac could prove valuable to lead the Slaves and he decides to bid on him. Asmodeus lost one Canton to the burning swords of the angels and Gilles de Rais still wishes to keep the option of becoming the Power behind his Throne. He then decides to hurl an insult against Sitri, hoping that the archfiend will react and invade his territory. Finally, I decide to increase Gilles's Cunning and Wickedness from 0 to 1. Gilles asks Duke Eligos to leave the Slaves and come back to him for debriefing. 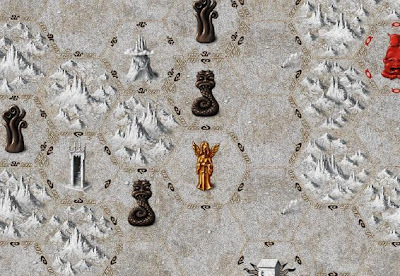 Scouts have spotted the angels in Sitri's territory, on their way to the Gardens of Infernal Delight, and Gilles does not wish to lose his oldest champion. Unfortunately, he does not expect Sitri to fall to the bait now that angels are roaming his land. Sitri's Hell Blades did not even scratch the blazing armors of the angelic host, which still threatens to wreak havoc on the Slaves of Gilles de Rais. But Duke Eligos is safe! Unsurprisingly, Sitri bowed before Gilles's insult. Too bad. Angry at this, Gilles demands tribute from Sitri. Now, much depends on the direction the angels will choose to continue their vendetta against the Powers of Hell. Gilles de Rais gives the Manual of Defense and the Manual of Infernal to Eligos, his most loyal servant. This way, if he ever needs a champion for single combat, he will have a decent fighter. 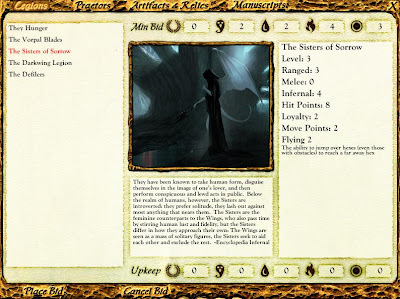 He also bids on the Veil of Smoke, a combat manuscript available in the Bazaar. I decide to increase again Gilles's Cunning and Wickedness, from 1 to 2. I have the souls and the time, so why not? This time, Murmur seems to be the focus of the angelic attention. Hmm, let's insult Asmodeus and see how he reacts. I give the Veil of Smoke to Eligos to protect him if he ever needs to enter an arena. The angels are reasonably far away. Gilles de Rais sends Valac to lead his army and prepare the way for the return of Duke Eligos. I increase the archfiend Martial Skill from 3 to 4. Gilles de Rais had forgotten that only one praetor may lead a legion. 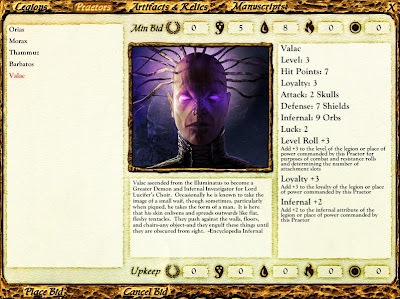 Valac cannot help Eligos... Gilles recalls Valac and ponders his next move, aware that 13 Conclave Tokens out of 20 have been revealed, and that the Plan B, codenamed "Operation Pandemonium", needs to be carefully prepared. For this reason, and because he is filthy rich, Gilles de Rais decides to acquire the Puzzle Cube, a relic which allows for instant travel throughout Hell. With it, if he so decides, he will be able to launch sudden strikes against distant enemies and places of power. 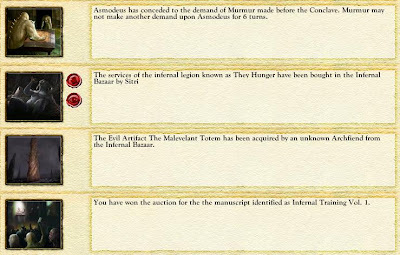 He also bids on the last missing tome of the Rite of Infernal Awe, offering extra tribute of two souls and nine flames of hellfire to the seller in the Bazaar in order to secure the deal. The angels keep destroying the armies of Hell, much to the satisfaction of Gilles, who hopes to be able to seize Pandemonium without much opposition if he needs to. The officials in Pandemonium share news of the Prestige of every archfiend: Asmodeus 200, Paimon 157, Murmur 80, Sitri 79, Gilles de Rais 69 and Lilith 37.